Seth Rogen hosted this week, but on May 3, Andrew Garfield and Coldplay will appear on Saturday Night Live , and I had no idea that both acts were British until literally five minutes ago. 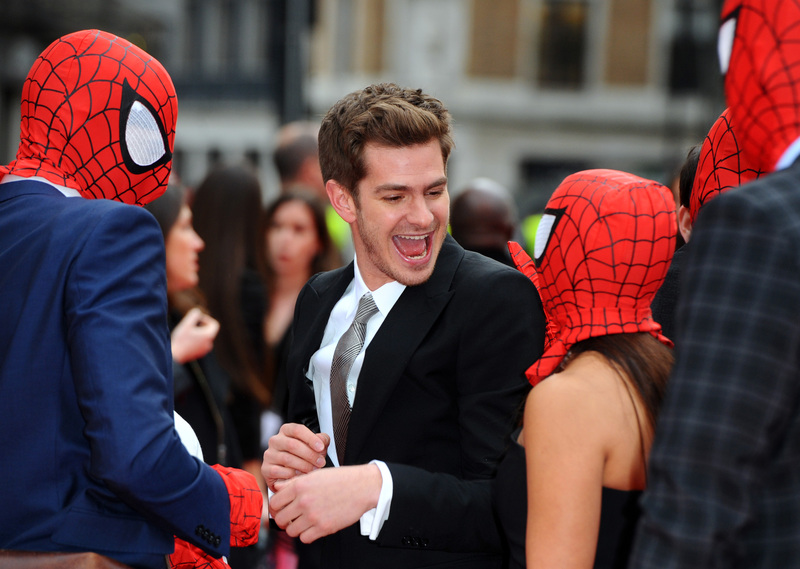 The Amazing Spider-Man actor was raised in Surrey, U.K., but has successfully managed to adopt an American accent in films like The Social Network. Based on his most recent acting choices, and his innate talents as a human being with a British accent, what can we expect from Garfield on the show? How might Coldplay be thrown in to the mix? Check out below for a prediction of Garfield's spoofs and characters on SNL three weeks from now, as well as what to expect from Coldplay. First, it's important to take Garfield's film career into account. Every celebrity loves to be roasted, and Garfield will have the opportunity to roast himself in his SNL appearance. In addition to his roles in The Social Network and The Amazing Spider-Man, Garfield is perhaps best known for romancing the (Emma) Stone and appearing in Never Let Me Go, a film about "a love triangle" between three friends at a boarding school. It's also a science fiction film about the ethics of organ donation, which makes it particularly ripe for the harvesting. Then again, The Amazing Spider-Man, which is Garfield's more recent project, will probably be in the cutting block instead. So, what can we hope for? While Garfield appears relatively unscathed after the making of his films, multiple actors in Broadway's Spider-Man: Turn Off the Dark have suffered injuries during the stage adaptation. Garfield, then, could appear as the head of a Spider-Man support group, where he could gripe about issues like "wearing spandex for a full day of filming" and "suppressing my naturally melodious accent." The other actors, meanwhile, could express disbelief at his "movie star" mentality, while emphasizing that they take "breaking a leg" very seriously, and have faced far more dangers than he ever has. Just as Garfield appears fully chastened, a Times Square Spider-Man bolts across the stage, stealing someone's purse. Garfield and Stone (Noel Wells) stop for dinner at a quiet restaurant somewhat off the beaten track, trying to gain respite from their stardom. They are both wearing sunglasses, and look away whenever another patron glances in their direction. Ultimately, however, the two attract attention. A gaggle of giggling girls approaches, sheepishly, and Garfield finally owns up to his fame, saying, "Yes, I'm--" only to be cut off by the girls, who shriek, "Harry Styles!" He shrugs it off to return to his dinner, only to have a middle-aged man approach him, telling him, "My son says you're the best superhero there has ever been." He agrees to sign a napkin for the man's son, only to drop it in disgust when the man asks him to complete it with, "Smooches, Harry." As a final straw, the manager lets them know that their meal is on the house; it's not every day that a One Direction star appears in their midst. As the couple angrily leaves, paparazzi appear and call out, "Taylor! Harry! How long have you been back together?!" Chris Martin calls the group together to let him know that, unfortunately, he will be consciously uncoupling from them in 2015. He announces that, like the little engine that could, he's realized that his couplings are dragging him back down the mountain. The band members react poorly, and suggest that he consciously uncouple from his hair stylist, as well as his vocal coach. The argument heightens until one of the band members drops an insult that inspires them to write a new song. They jam out for a bit, ultimately realizing, "I don't want anybody else but you." Oh, Water for Elephants. I hope you got your cut. I'm sensing a middle school dance, here. Garfield has shown us that he knows modern dance, and he could appear as an older brother chaperone to his sister (Nasim Pedrad's Shallon? Bryant's Melanie from "Slumber Party?" too much?) who gets roped into a dance off with the gym teacher, Taran Killam. The prize? A passing gym grade for his sister. Killam, after all, learned the entire dance to Robyn's "Call Your Girlfriend," so he would be more than up to the challenge. Here's a hirsute Garfield performing his dance moves on Ellen. For the kids. We wish Garfield the best of luck on his first hosting gig at SNL, and are confident that, if he can anesthetize his British accent, he can embody any character he is called upon to portray. In addition, we hope that Emma Stone pops in during his monologue, just as he did when she hosted in 2011. Wait, have they really been together for that long? Looks like Garfield's webs are holding fast, and his performance with Coldplay should light up the night on May 3!